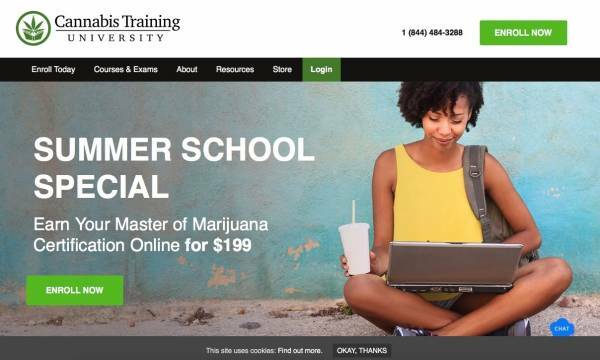 Cannabis Training University World's Leading Online Medical Marijuana School. The World's Leading Online Medical Marijuana School! Get certified as a cannabis grower today. Start your own cannabis business. Land a job in the booming, hottest industry in North America. The premier cannabis certification college. Over 100 cannabis videos, more than 5000 pages of cannabis e-books, online quizzes, and the most recognized cannabis certificates in North America. Get CTU certified and start a cannabis career. Learn how to grow marijuana from the leading cannabis cultivators in the world. CTU is the first cannabis college online, and has the most students of any marijuana university. Anyone can sign up, from any country. Learn how to start a cannabis business or grow your own cannabis. Get a marijuana job with your CTU certificate.